Background: Plumbagin, a plant-derived naphthoquinone is known to be biosynthesized by polyacetate-malonate pathway. The ayurvedic drug Chitraka is obtained from the medicinal plant Plumbago zeylanica Linn, which belongs to the family Plumbaginaceae. The Chitraka is found used in the traditional forms of medicine for the treatment of various illnesses, since ancient times. Aim: The present study concerns the microscopic, powder and quantitative microscopic characteristics of the root of Plumbago zeylanica Linn. Materials and Methods: Delimiting the morpho-histological profile of the root using digital, stereo and polarized microscopic techniques and to develop the chromatogram of the extract of the root of Plumbago zeylanica Linn using High performance thin-layer chromatographic (HPTLC) method. Results: The presence of cortical deposition of plumbagin pigment as yellowish tints in the surface view of the sections of root, arrangement of starch grains as bunches of grapes in cortical tissues and ray parenchyma, crystal idioblasts containing calcium oxalate embedded in the intervening walls of the cortical cells, distinct band or patch of sclreids at the pericyclic region of the phloem, wood with non-storied cambium, distinct growth ring boundaries, paratracheal axial parenchyma, chains of vessels in radial multiplies of three to four, uniseriate to biseriate medullary rays with homogeneous cells, crowding of vessels at the central portion of secondary xylem, wood plugged with tylosis and low mesomorphy ratio for wood were the anatomical features characteristics of the taxon. The HPTLC profile of the methanol extract of root developed using the mobile phase, n-hexane:ethyl acetate (8:2 v/v) had revealed four phytoconstituents. The Rf value for plumbagin (C11H8O3) was found to be 0.86. Densitometric scanning had shown λmax of plumbagin at 270 nm. Spectral matching by overlaying the spectra of both standards and extract of root sample were confirmed the specificity of λmax at 270 nm for the marker compound. The calibration curve was found to be linear in the concentration range of 2.00 to 10.00 μg/ band with the polynomial calibration equation Y=178.8+91.61*X+-4.825*X2 and estimated that 5 μL of methanol extract of roots contained 1.326 μg of plumbagin. Thus the content of marker constituent (plumbagin) present in shade-dried roots of Plumbago zeylanica Linn (a Kerala habitant) was estimated as 0.179%. 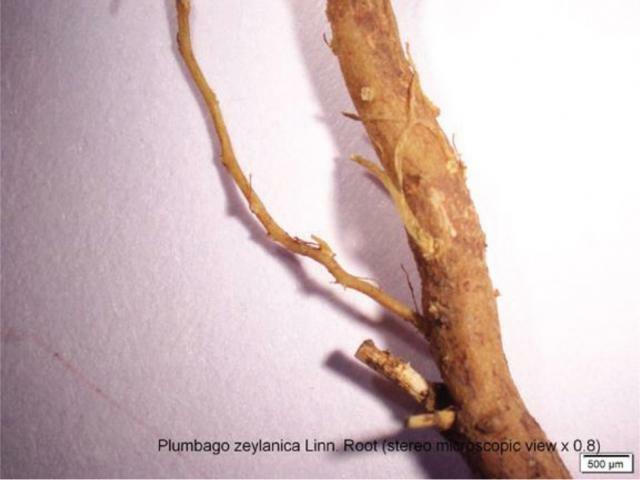 Conclusion: The present study suggests that the delineated characteristics of the roots of Plumbago zeylanica Linn could tag as the identifying parameters to substantiate and authenticate the raw drugs from the spurious/adulterants materials and developed HPTLC method could be effectively used for the regulatory perspectives and quality assessment of plumbagin in the polyherbal formulation/finished products of traditional medicine. Sudhakaran MV. Histo-Chromatographic Finger Printing Profiles of the Root of Plumbago zeylanica Linn and Quantification of Marker Compound, Plumbagin. Pharmacognosy Journal. 2017;9(6s):s77-s86.